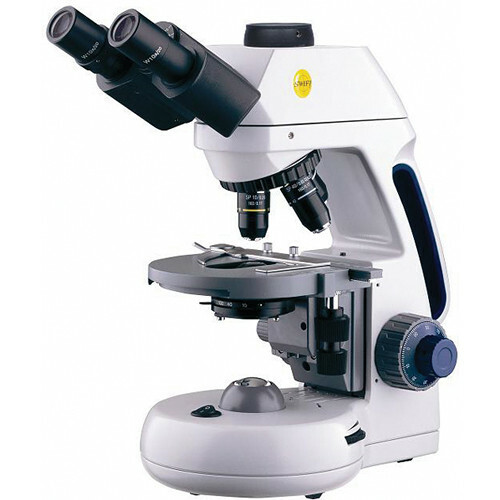 The Swift M15T-P Infinity Corrected Microscope inspires your students or employees to great heights. Even Robert Hooke would be impressed by this trinocular microscope. While moderately priced, the M15T-P packs in a number of features, such as infinity corrected optics that are parcentered and parfocaled. The widefield 10xd, 20mm eyepieces offer an increased field of view, while the Siedentopf head features a 45° ergonomic incline. The infinity corrected plan objectives provide 4xd, 10xd, 40xrd, and 100xrd options, while an Abbe 1.25 DIN rack and pinion condenser and variable LED light source all work together to show the specimen clearly and accurately. Other highlights of the microscope include a slow-closing slide holder clip on the mechanical stage, a plastic iris diaphragm shield, high-grade synthetic lubricants for smooth, precise operation, and all-metal internal parts that ensure long-lasting durability.